Latiff, A. & M. Wong. 2003. 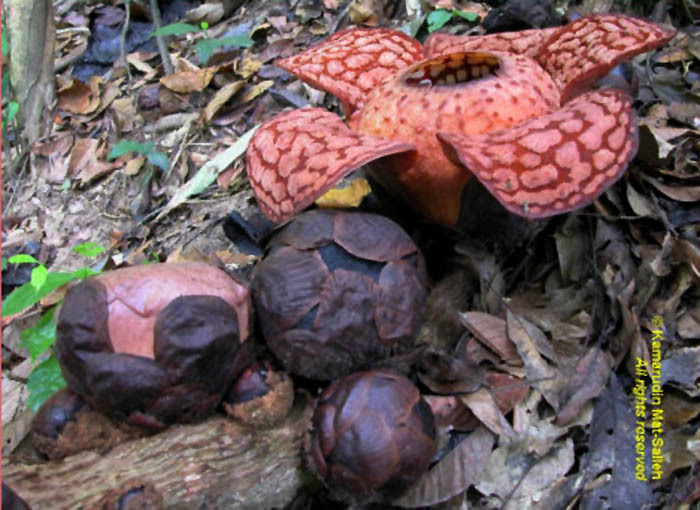 A new species of Rafflesia from Peninsular Malaysia. Folia Malaysiana 4: 135-146. The species name is in honor of HRH Paduka Seri Sultan Perak, Sultan Azlan Shah, the patron of the Malaysian Nature Society Heritage and Scientific Expedition to Belum. Populations are known from Perak and Pahang states of peninsular Malaysia. There exists confusion about the specific status of this taxon. The number and pattern of warts on its perigone lobes are intermediate between R. cantleyi and R. hasseltii. Indeed, Meijer (2001) even suggested that this could be a hybrid between the two species, however, this seems unlikely given that the latter species appears restricted to Sumatra. Molecular data collected to date are of little help in resolving the issue. Barkman et al. (2008) did not sample this taxon. In a later study (Bendiksby et al. 2010), this taxon was found to be genetically identical to R. cantley and R. kerrii. This shows the molecular markers used did not provide good species level resolution, even between morphologically distinct species. Latiff and Wong (2003) compared morphological features of R. azlanii with R. cantleyi and R. hasseltii. 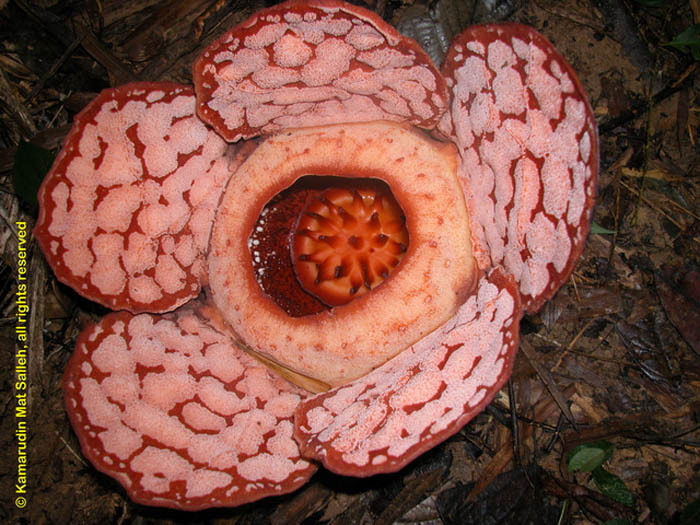 Rafflesia azlanii features that overlap either R. cantleyi and/or R. hasseltii include flower size, perigone lobe dimensions, wart coalescence, ramenta length, number of processes and anther number. Features that differ between R. azlanii and the other two species include the number of wart rows, diaphragm diameter, number of circular dots on diaphragm, and ramenta branching. For now, this taxon will be considered a distinct species, but confirmation of this must await the application of appropriate molecular markers to all named Rafflesia taxa. Fully open flower of Rafflesia azlanii. From the web blog by Kamarudin Mat-Salleh. View of an open flower of Rafflesia azlanii with some unopened buds. From the web blog by Kamarudin Mat-Salleh.